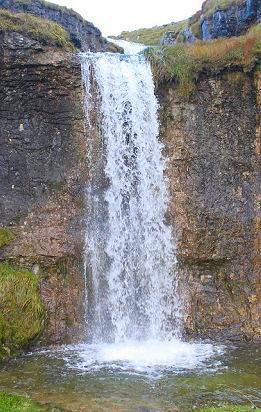 Cote Gill cascades 4 metres into a drop pool. The combination of limestone hills and the heavy Pennine rainfall has sculpted this whole area into an stunning mixture of limestone cliffs, limestone pavements, steep valleys and waterfalls. Cote Gill had etched a steep sided gulley through the limestone, creating a stunning small ravine. Littondale, beside Upper Wharfedale, consists of mainly Great Scar Limestone and Yoredale rock. The dale has a number of shake holes and sink-holes that lead to underground cave systems such as at Boreham Cave, the dale is rich in Bronze Age and Iron Age settlements. At the head of the Lintondle is Pen-y-Ghent, which rises to a height of 2,277 feet	(694 metres) and is one of the famous Yorkshire Three Peaks, the other two being Ingleborough and Whernside. 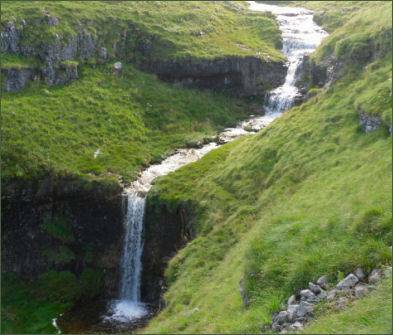 The waterfall is accessed by a footpath from Arncliffe Cote.